David Sternlight is a Wall Street executive, whose career is on the ropes despite numerous contributions to his former firm, Dean, Adams & Company. Now semi-retired, David stays active trading the markets; but has many internal battles raging under a calm exterior. His wife Eva is one of his few sources of comfort. After a celebratory party for the promotion of his ex-boss, Jack Howell, David is aggressively recruited to join a secretive government agency led by a shadowy figure named John McCabe. The reason is McCabe’s belief that certain predictive applications of Sternlight’s financial software, Excalibur, can be adapted to the war on terror. Without much choice, Sternlight agrees and sees an opportunity to do good things while also fighting the severe mental depression he suffers since the death of his son, Andy, in the 9/11 World Trade Center attacks. However, militant supporters of Jihad continue in the world, one of which is a young Palestinian doctor named Samir Hijami. The doctor plans a biological strike with an Ebola-like virus that he plans to take within him from Pakistan to London, and then on to Las Vegas. Self-infected, he carries the virus like a viral suicide vest. The biological attack is somewhat obscured by other lesser terrorist actions predicted by Excalibur and going on simultaneously. The new terror strategy is a main strike within numerous head-fakes for distraction. Due to miscalculations by Hijami, the main center of the virus outbreak prematurely becomes London. The culmination of many events leads to the intersection of good and evil, and a surprising reaction within the Muslim world. In the aftermath of the terrorist attacks and the ongoing influence of the Boy Prophet, Sternlight comes to grips with his strengths and weaknesses; and the realization that more battles will still follow. 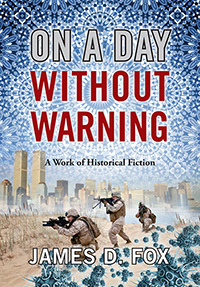 James D. Fox brings us his first novel with “On A Day Without Warning.” Jim is a former stockbroker and bond trader. He is a 1971 Liberal Arts graduate of Brooklyn College (CUNY) where he majored in both Economics and Political Science. He also holds an MBA from New York University (1974). As an ongoing student of history and literature, Jim believes a well-crafted work can bring more than just entertainment to his audience. In this work of historical fiction, Jim shows his belief that goodness can evolve from the difficult dilemmas that we currently face. 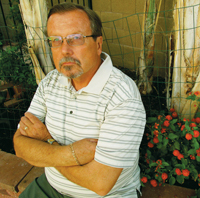 Both he and his wife, Melissa, live with their three dogs in a suburb of Phoenix, Arizona.